SOUTH BEND — Lilly Reyna told a crowd at Sinai Synagogue on Sunday that she worries about what police might do if they encounter her son, a Navy veteran who suffers from PTSD, during a psychotic episode. She referred to an officer-involved shooting last year in which a Latino man with mental health issues was shot dead after he confronted police with knives. 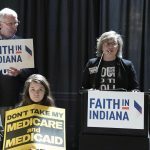 “It might have been avoided if trained mental health workers had been on the scene,” said Reyna, who was among several speakers at the town hall event organized by the St. Joseph County Chapter of Faith in Indiana. “Treatment, not incarceration” was the mantra of the gathering. Leaders of the faith group called on elected officials to commit to implementing jail diversion strategies for people suffering from mental illnesses and drug addiction. Among other things, strategies call for launching a pre-arrest diversion program that would pair police officers with medical professionals to identify those suffering from mental illness or addiction so they can be referred to treatment, along with a Peacemaker Fellowship mentorship program aimed at getting those who face the highest risk of gun violence out of street life. Jeff Walker, a member of the faith group, highlighted how the group did a lot of research last year on strategies for reducing incarceration and gun violence. Walker cited statistics that show the county jail’s current inmate population of 620 is up by more than 100 from 2015. On the stage were County Sheriff Bill Redman, County Commissioner President Andy Kostielney and South Bend Common Council President Tim Scott. Redman was asked by the group if he is willing to to help come up with a plan to cut incarceration by 30 percent in the next three years and develop a funding stream for jail diversion strategies. Redman said he will fight for programs aimed at treating mental illnesses and substance abuse. Kostielney and Scott also made commitments to back the group’s efforts. 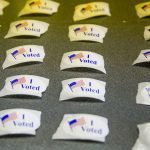 Numerous candidates for city mayor and Common Council seats, meanwhile, signed a pledge to support the group’s “families first” agenda.